(Nanowerk News) The goal of the eNterop project, which is partly funded by the German government, is to ensure the smooth interoperation of cars and charging points from different manufacturers. International standard ISO/IEC 15118 defining communication between vehicle and charging station was recently established to guarantee this interoperability. For manufacturers of control equipment and charging points, however, the implementation of the standard involves elaborate testing with a wide range of different product types and in all kinds of different use cases. The partners in the eNterop project are writing software that will enable the development and testing of standardized products based on the applications included in the standard. The main purpose of the tools is to support the technology for developing the market. The project was launched in July of 2012 and will run for a period of two years. On January 21, the partners presented their plans and initial results in Berlin. Siemens showed a prototype for charging with direct current that already conforms to the standard as well as a system for inductive, cordless charging for which the standard is still to be implemented. An important factor in the acceptance of electric cars is how frequently and easily e-cars can find places to charge up at any time. 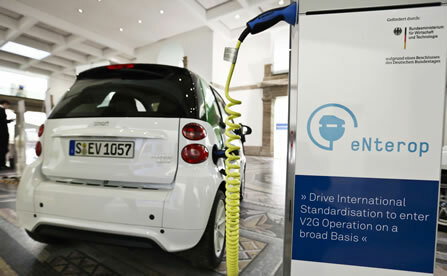 Most cars in use today are restricted to specific manufacturers' charging points. This is due in part to the "filling process" whereby users can, for example, set the charge duration, electricity price limits, and minimum charging level. The charging point and the car then use these settings to generate a so-called charging timetable, taking into account the network condition, electricity price forecasts, and other information. Until now, each manufacturer has different options. The ISO/IEC 15118 ensures that all utilization modes will be supported by every manufacturer. eNterop is devising automated test routines that all contain applications included in the standard. Using this software, manufacturers can perform tests to determine whether or not their products conform to the standard. It also provides a reference software platform that companies can use to develop a standard-compliant product. The global Siemens research unit Corporate Technology is working on applications and the test software. In addition to Siemens, the other partners in the eNterop project are BMW, Continental, Daimler, RWE, and VW as well as Dortmund Technical University, the Fraunhofer Institute for Factory Operation and Automation and the Fraunhofer Institute for Wind Energy and Energy System Technology. The project cost of €4.6 million will be split 50/50 between the industry partners and the German Federal Ministry of Economics.